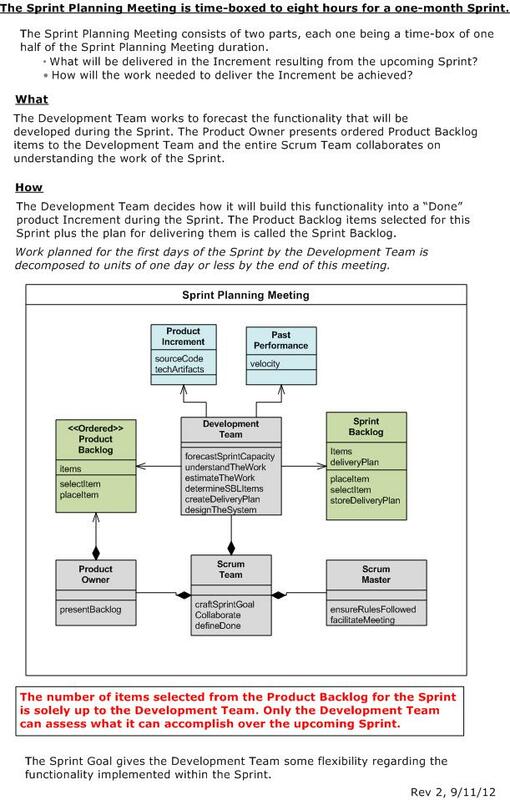 Since the UML Scrum Cheat Sheet post is getting quite a few page views, I decided to conjure up a class diagram that shows the static structure of the Scrum Sprint Planning Meeting (SPM). The figure below shows some text from the official Scrum Guide. It’s followed by a “bent” UML class diagram that transforms the text into a glorious visual model of the SPM players and their responsibilities. Of course, BD00 has no clue what shenanigans take place during unsuccessful agile adoptions. In the interest of keeping those consulting and certification fees rolling in, nobody talks much about those. As Chris Argyris likes to say, they’re “undiscussable“. So, Shhhhhhh!